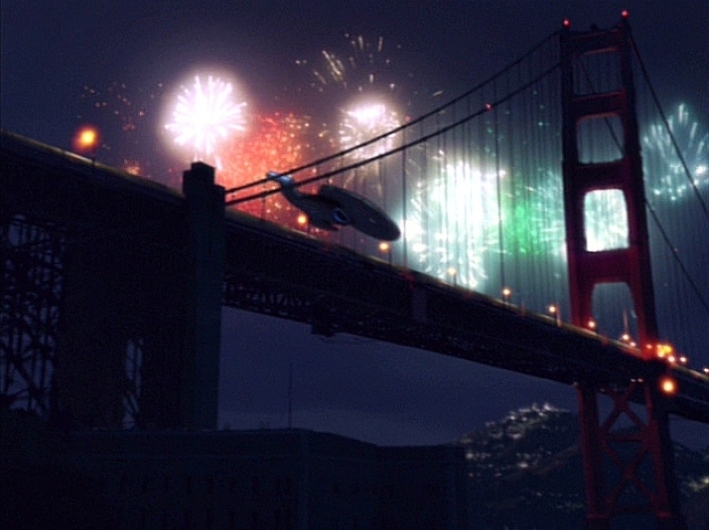 Voyager was the third Star Trek show in a row to reach 100 episodes. The cast and production crew had a party behind the scenes, with a big cake, as well as a celebration scene in “Timeless.” The Voyager crew are celebrating the installation of their Quantum Slipstream drive. B’Elanna even toasts the new warp drive with a bottle of champagne. Janeway raises a glass and says this is their ticket out of the Delta Quadrant after nearly five years of an arduous journey. But not all are enjoying the celebration. Paris is already obsessing about the new engine. He’s worried the drive is defective. Harry Kim takes him to the holodeck where they run simulations. Twenty runs and twenty catastrophes later, the two bring their concerns to the Captain. 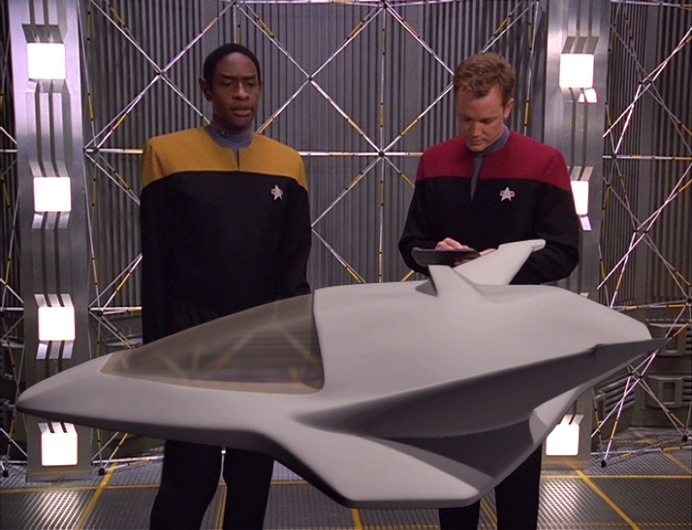 Rather than scrap the project entirely, Harry proposes to take the Delta Flyer into the Slipstream ahead of Voyager and send course corrections to compensate for turbulence. The USS Voyager is the only Federation ship in the Delta Quadrant and Captain Kathryn Janeway’s primary mission is to get her crew back home. Along the way they’ve explored new worlds. Unfortunately, most of the aliens they encounter are hostile. Still two years into their journey, the crew is in high spirits for the most part. They have begun to bond outside of work. More often than not, the crew gathers on the holodeck, a virtual reality room that can be programed to recreate any place real or imaginary. In the beginning of “Coda,” Neelix and Janeway talk about how well talent night went the evening before. 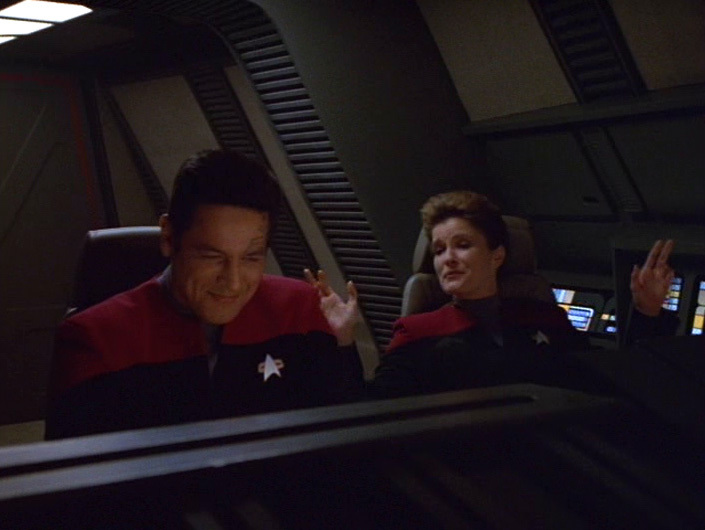 During a shuttle trip, Chakotay points out that Kathryn’s ballet act was the highlight. She goads him into signing up for the next one before detecting surprise turbulence. 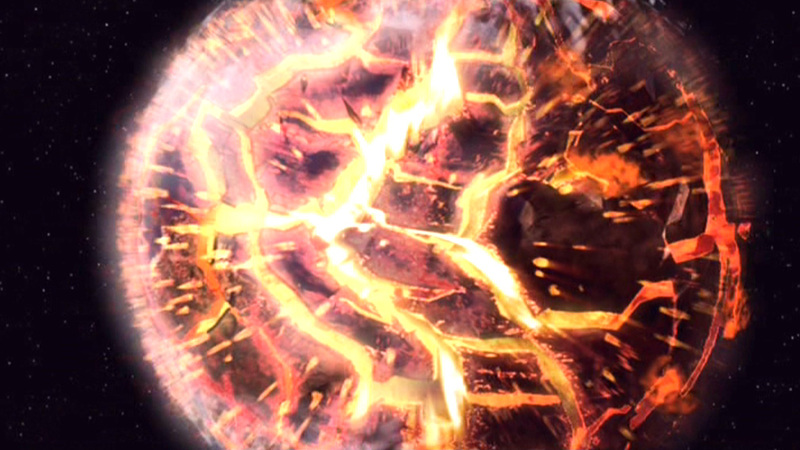 The two struggle to land the shuttlecraft and Janeway is severely injured in the crash. The Vidiians, a hostile race of organ harvesters from Season 1 and 2, surround Chakotay and Janeway. They shoot the commander and strangle the captain. The mid-nineties were a very busy time for Star Trek. 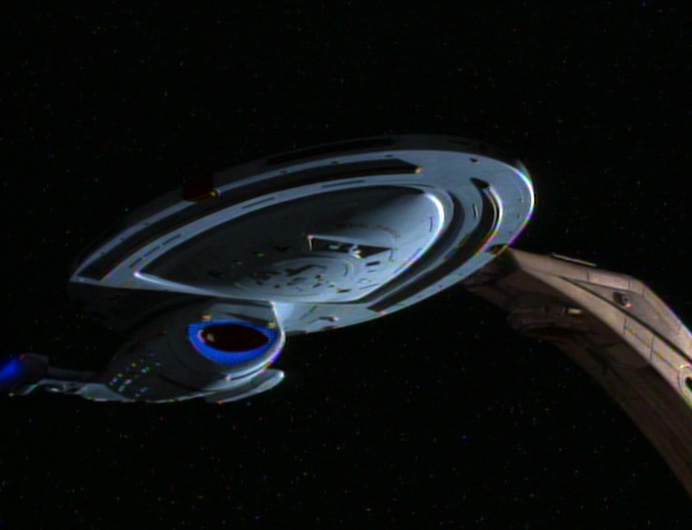 The third spin-off of the original show, Star Trek: Voyager was in development soon after it was announced that TNG was ending. It was the first show to feature a female captain. Premiering in January 1995 on a new network backed by Paramount, Voyager introduced viewers to Captain Kathryn Janeway and her ship, the Intrepid class USS Voyager. The ship was much smaller than the Enterprise-D with a crew of only 141, and no civilians. 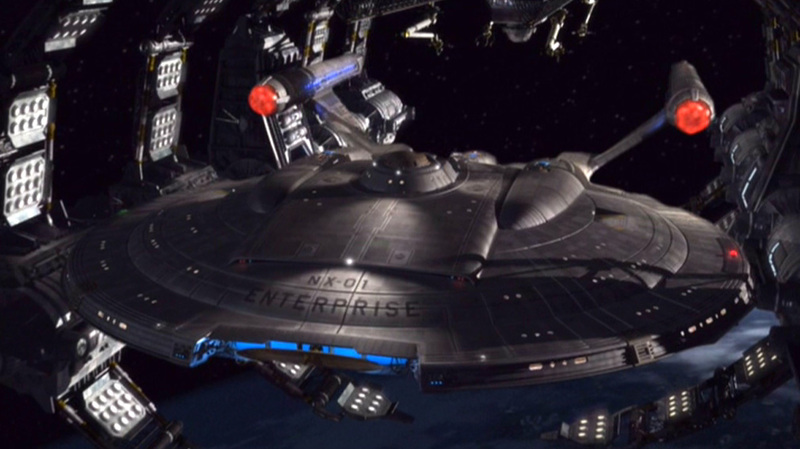 Behind the scenes Voyager was created by Rick Berman, Michael Piller, and Jeri Taylor. All three had experience with TNG. Jeri Taylor was the one of the first female executive producers and primarily responsible for the creation of Janeway’s character. They set the show aboard a starship once again but made sure to distinguish it from TNG. The smaller Voyager was designed for different missions, instead of exploring the Galaxy. 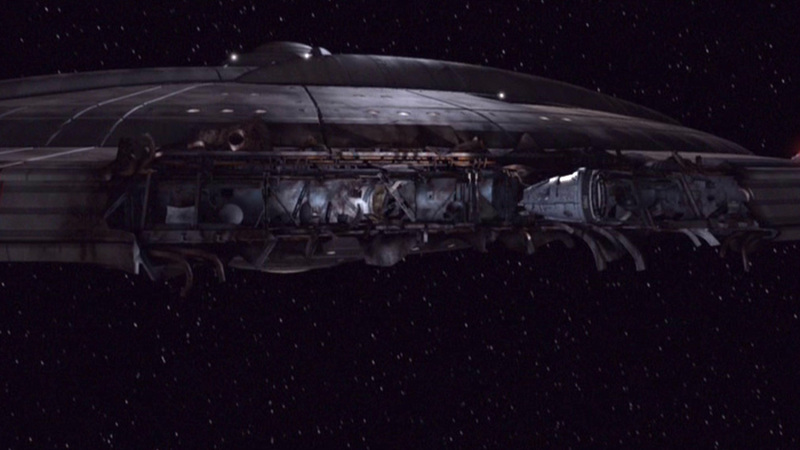 The premise of the show was that Janeway and her crew were stranded in the Delta Quadrant, 75 years from home.